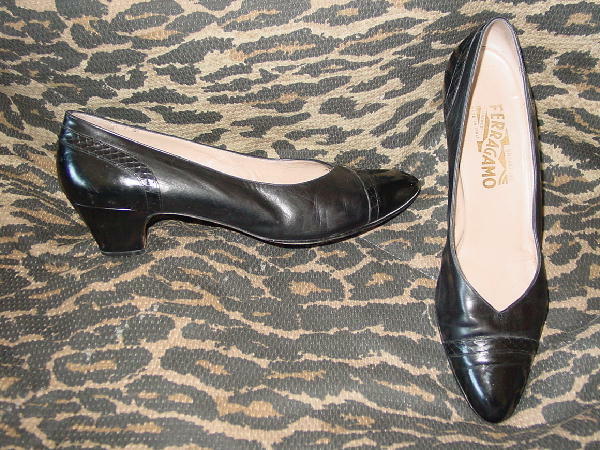 These vintage black smooth and patent leather pumps are by Salvatore Ferragamo and were made in Italy. They have a snakeskin strip accent across the vamp and angled along both back sides. The toe caps, foot backs, and heels are patent. The leather is soft but there are wrinkles on the smooth areas and scuff marks on the patent areas. The soles have quite a bit of wear. The white area on the right front bottom side is from the flash.